I can admit with great ease that I have a love for all things cooking and food. Sometimes the only thing that gets me out of bed is the promise of a decent meal. With this kind of culinary affection comes an admitted interest in culinary television programming and their related celebrity chef personalities. With this in mind, I read Starve with great interest. The story of Gavin Cruikshank and what has become of him and his television show, for which the title of the series is named, is an interesting twist on celebrity culinary culture, the inequalities of the classes, and how fame and secrets can make or break a family. Wood writes Cruikshank like an Anthony Bourdain type who, after coming out of the closet, has left his family and gone off the grid. However, years later, still under contract from the network that airs his show, he is brought back into civilization; albeit one that is in despair due to climate change . He comes face to face with his estranged wife, friends — new and old, some enemies, and the daughter he abandoned. Gavin also comes to find that his show is no longer the travelogue he had intended it to be, but now a culinary blood sport (Think Iron Chef, but with more punching and independent food sourcing) of serving the most endangered foods to a panel of judges with the fattest wallets; on top of it all, it is hosted by one of Gavin’s rivals in the culinary world, Roman Algiers. To bring in ratings Gavin is brought on for a season as a competitor. Gavin’s wife, bitter over the humiliation she felt as a result of Gavin’s coming out, not only is profiting off of Starve, but also keeping Gavin away from his now adult daughter, Angie. Zezel’s art in combination with Wood’s narrative is a raw, and sometimes visceral, thing to behold. The incredibly dark palette and thick lines makes the story become very noir in nature and is not always simple to follow with the eye. However, as a reader, I did find it to grow on me quite a lot as the story goes on. The moments in which the characters facial expressions are in clear and explicit detail are some of the most rewarding moments of the story. The page layouts, once you get used to them, are often engaging and beautiful in their more complex nature. 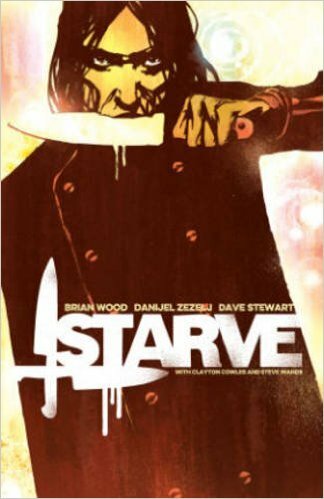 Starve, for me, was a page turner. It has an interesting dark premise that frames a touching story about a man who deeply wants to reconnect with his daughter. Through that desire, he uses his skills as a chef to make food into not only a requirement for survival (in more ways than one for Gavin), but also something I’ve always believed it to be: a language of love. Starve Vol. 1 comes out on January 13th from Image Comics. I received a digital copy of the book for review from Image Comics.